The Model 2115CR Medium Duty Multi-Axis Positioner is designed to provide smooth rotation of a test object in both theta and phi axes. 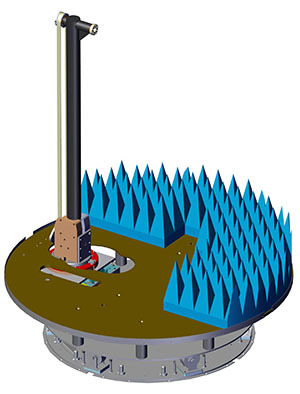 Typically the Model 2115CR is used in systems that measure spherical antenna patterns and total effective radiated power of a wireless device. MAPS units are currently in operation at several CATL labs. Options include the SAM Phantom (head or head and shoulders) and our Positioning Controller with GPIB and EMQUEST Software. The units are constructed with low reflective dielectric materials to minimize RF obstruction or distortion. MAPS Model 2115CR has been carefully designed from the frame up to minimize EMI noise, and offer minimal physical obstruction to RF fields. Motor units enclosed in RF shielded enclosures are designed to be placed below the absorber. Signal lines from motor to the optional Positioning Controller are fibre optic. The unit is designed for structural integrity with low mass, low RF reflective dielectric materials.